The Collier Trophy is an annual aviation award administered by the U.S. National Aeronautic Association (NAA), presented to those who have made "the greatest achievement in aeronautics or astronautics in America, with respect to improving the performance, efficiency, and safety of air or space vehicles, the value of which has been thoroughly demonstrated by actual use during the preceding year." Robert J. Collier, publisher of Collier's Weekly magazine, was an air sports pioneer and president of the Aero Club of America. 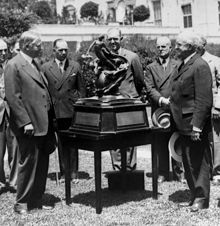 He commissioned Baltimore sculptor Ernest Wise Keyser to make the 525 pound (240 kg) trophy in 1911, it was originally named the Aero Club of America Trophy. Collier also was the owner of a Wright Model B biplane which he purchased in 1911. After presenting it several times, Collier died in 1918 after the end of World War I. It was renamed in his honor in 1922 when the Aero Club dissolved, and the award was taken over in 1923 by its replacement the NAA. The name became official in 1944, and the award presented once a year by the NAA president, with the trophy on permanent display at the U.S. National Air and Space Museum. As such, the trophy was in the custody of its 1969 co-recipient Michael Collins during his directorship of the museum. The trophy was stolen briefly in 1978, but was recovered. 1911 – Glenn H. Curtiss, for successful development of the hydro-aeroplane. The first award. 1912 – Glenn H. Curtiss, for the invention of the single-pontoon seaplane and development of the flying boat. 1913 – Orville Wright, for development of his automatic stabilizer. 1914 – Elmer Sperry, for his invention of gyroscopic control. 1915 – W. Starling Burgess, for the Burgess-Dunne BD series of semi-flying wing seaplanes. 1921 – Grover Loening, for development of the Loening Flying Yacht. 1922 – United States Air Mail Service, for the first transcontinental air mail route. 1923 – United States Air Mail Service, for the first transcontinental air mail route involving night flight. 1925 – Sylvanus Albert Reed, for the metal propeller. 1928 – Aeronautics branch of the United States Department of Commerce for development of airways and navigation facilities. 1929 - Fred Weick, for design of the NACA cowling which revolutionized civil air transport by making aircraft faster and more profitable. It also found application on the bombers and fighters of World War II. 1930 - Harold Frederick Pitcairn and associates for development of the autogyro. 1932 - Glenn L. Martin for the design of the Martin B-10 (XB-907) bomber. 1933 - Frank W. Caldwell of Hamilton Standard for the hydraulically controllable propeller. 1934 - Albert Francis Hegenberger for the first blind flying landing system. 1935 - Donald W. Douglas and his technical and production personnel. 1936 - Pan American Airways for establishment of a transpacific airline and the successful execution of extended overwater navigation in regular operations. 1937 - Army Air Corps for the design and development of the Lockheed XC-35. 1945 - Luis W. Alvarez for the Ground Controlled Approach (GCA) which allowed radar operators to talk a pilot down. 1947 - Chuck Yeager for piloting the Bell X-1, the first aircraft to break the sound barrier. 1950 - The Helicopter Industry, the Military Services, and the Coast Guard – for development and use of rotary-wing aircraft for air rescue operations. 1952 - Leonard S. Hobbs of United Aircraft Corp., for the design, development, and production of the J-57 jet engine. 1954 - Richard T. Whitcomb for his discovery of the area rule, a design method for supersonic aircraft. 1958 - Clarence "Kelly" Johnson of Lockheed Skunk Works, and Gerhard Neumann and Neil Burgess of GE, for leadership in the development of the F-104 Starfighter and its J79 engine. 1960 - Vice Adm William F Raborn for directing the creation of the Polaris fleet ballistic missile system. 1961 - Scott Crossfield, Joseph A. Walker, Robert Michael White and Forrest S. Petersen, X-15 test pilots. 1963 - Clarence "Kelly" Johnson, for his leadership at Lockheed's Skunk Works in the development of the SR-71 Blackbird. 1967 - Lawrence "Pat" Hyland, President and CEO of Hughes Aircraft: for placing the eyes, ears & hand of the United States on the Moon. 1970 - The Boeing Company for their introduction of the Boeing 747. 1971 - David Scott, James Irwin, Alfred Worden, and Robert Gilruth of the Apollo 15 mission. 1972 - The Officers and Men of the 7th Air Force and 8th Air Force of the United States Air Force and Task Force 77 of the United States Navy (1972) for their work on Operation Linebacker II. 1977 - Robert J. Dixon for his work on Red Flag. 1978 - Sam B. Williams for development of the small, high-efficiency turbofan. 1979 - Paul MacCready for the MacCready Gossamer Albatross. 1989 - Ben Rich for leading Lockheed's Skunk Works to develop the first stealth aircraft, the F-117. 1991 - The Northrop Corporation, the Industry Team and the United States Air Force for the Northrop Grumman B-2 Spirit. 1992 - Naval Research Laboratory, US Air Force, Aerospace Corporation, Rockwell International, and IBM Federal Systems Company for Global Positioning System (GPS). 1994 - McDonnell Douglas for developing the C-17 Globemaster III. 1995 - Boeing Commercial Airplanes and the Boeing 777 airliner development team, winner for producing the advanced 777 widebody twinjet. 2002 - Sikorsky Aircraft and the S-92 team, led by Nicholas Lappos. 2003 - Gulfstream Aerospace for the development of the G550, the first civil aircraft to include an enhanced vision system as standard equipment. 2005 - Eclipse Aviation for the advancement of general aviation in the production of very light jets, specifically, the Eclipse 500. 2006 - The F-22 Raptor team, consisting of the United States Air Force, Lockheed Martin, BAE Systems, Boeing, Northrop Grumman, Raytheon, Pratt and Whitney, and 1,000 other suppliers located in 42 states. 2007 - Various public and private organizations and companies for their innovative work on Automatic Dependent Surveillance-broadcast (ADS-B). 2012 - NASA/JPL Mars Science Laboratory/Curiosity project team for their successful Mars mission. 2013 - Northrop Grumman/U.S. Navy/Industry team for designing, building, and demonstrating the X-47B; and for the aircraft's ability to autonomously operate from and perform arrested landings upon an aircraft carrier. 2017 - Cirrus Aircraft for designing, certifying, and entering-into-service the SF50 Vision, the first single-engine personal jet; and for their inclusion of the Cirrus Airframe Parachute System (CAPS) on the aircraft. ^ Larson, George C. (August 1976). "The Founding Father". Features. Flying. Vol. 99 no. 2. Ziff Davis. p. 76. ISSN 0015-4806. Retrieved 20 July 2016 – via Google Books. ^ Ritchie Thomas. "Sylvanus Albert Reed Inventor". AAHS Summer 1992: 103. ^ Warren-Findley, Jannelle (1998). "The Collier as Commemoration: The Project Mercury Astronauts and the Collier Trophy". In Mack, Pamela E. (ed.). From Engineering Science to Big Science: The NACA and NASA Collier Trophy Research Project Winners. The NASA History Series. Washington, D.C.: NASA History Office, Office of Policy and Plans. p. 165. ISBN 0-16-049640-3. LCCN 97027899. OCLC 37451762. NASA SP-4219. Retrieved March 26, 2018. ^ "Astronauts Have Their Day at the White House". Chicago Tribune. Chicago, Illinois. October 11, 1963. p. 3 – via Newspapers.com. ^ "Collier 1960-1969 Recipients - NAA: National Aeronautic Association". naa.aero. Retrieved 15 January 2019. ^ "Apollo 11 Honor". The Burlington Free Press. Burlington, Vermont. May 7, 1970. p. 3 – via Newspapers.com. ^ a b c d e f "Collier 1970-1979 Recipients - NAA: National Aeronautic Association". naa.aero. Retrieved 31 July 2017. ^ Haugland, Vern (March 22, 1972). "Apollo 15 astronauts, Gilruth to be honored". El Dorado Times. El Dorado, Arkansas. Associated Press. p. 13 – via Newspapers.com. ^ "Collier 1970-1979 Recipients - NAA: National Aeronautic Association". naa.aero. Retrieved 2019-04-09. ^ a b c d e f g h i "Collier 1980-1989 Recipients - NAA: National Aeronautic Association". National Aeronautic Association. ^ Maisel, Martin D., Demo J. Giulianetti and Daniel C. Dugan. NASA SP-2000-4517, "The History of the XV-15 Tilt Rotor Research Aircraft: From Concept to Flight" (PDF) p155 NASA, 2000. Accessed: 17 March 2012. ^ a b "Collier 1990-1999 Recipients". National Aeronautics Association. ^ a b "Collier 2000-2009 Recipients". National Aeronautic Association. ^ "Propulsion System in Lockheed Martin Joint Strike Fighter Wins Collier Trophy" (Press release). Fort Worth, TX: Lockheed Martin. 28 February 2003. Archived from the original on 25 May 2011. Retrieved 10 January 2010. ^ "GAPAN to bestow top flight operations award on Nick Lappos" HeliHub, 2 October 2013. Accessed: 13 October 2013. ^ "Sikorsky X2 Technology™ Demonstrator Wins Prestigious Robert J. Collier Trophy" (Press release). Stratford, CT: Sikorsky. 15 March 2011. Retrieved 20 July 2016. ^ Warwick, Graham (16 March 2011). "Sikorsky's X2 – Collier Win, Commercial Next?". Aviation Week. Archived from the original on 9 March 2014. Retrieved 8 March 2014. ^ Larson, George (23 March 2011). "Sikorsky's X2 and the Collier Trophy". Aviation Week. Archived from the original on 9 March 2014. Retrieved 8 March 2014. ^ "Boeing 787 Dreamliner Wins Coveted Collier Trophy" (Press release). Washington DC: Boeing. PR Newswire. 13 March 2012. Retrieved 20 July 2016. ^ a b c "Collier 2010-2019 Recipients - NAA: National Aeronautic Association". National Aeronautic Association. ^ Kauh, Elaine (12 March 2015). "Gulfstream G650 Wins 2014 Collier Trophy". AVweb. Retrieved 13 March 2015. ^ Kauh, Elaine (10 March 2016). "NASA-JPL Dawn Mission Team Wins 2015 Collier Trophy". AVweb. Retrieved 22 May 2016. ^ Berry, Stephanie (29 March 2017). "Blue Origin New Shepard to Receive the 2016 Robert J. Collier Trophy" (PDF). NAA. Retrieved 29 Mar 2017. ^ "Cirrus Aircraft Vision Jet to be awarded the 2017 Robert J. Collier Trophy" (PDF) (Press release). NAA. April 4, 2018.